Campbell served up a timeless reminder to never act as if you’re the smartest one, with any group, in any room. This is a lesson repeated to would-be leaders. Acting as though you’re the best, smartest, or whatever quality, blocks learning and its segue of doing—something that Campbell proactively thrives on, as demonstrated in his personal blog Greyscalegorilla, “one of the leading sites to learn about motion graphics and 3D software.” In a recent LinkedIn article, Hunter Walk, Director of Product Management at Google, recommends, “Don’t try to be the smartest person in the room anymore. The smart person isn’t sitting in any room—she’s out there getting stuff done.” In addition to learning and then doing, Campbell takes it further by sharing. Happiness is one of the best natural resources. To Campbell, being happy naturally benefits everyone’s quality of life, especially, as he expressed with excitement: “to make better stuff.” Happiness begets happiness in the form of “by-products.” Jason Fried, Co-Founder of 37signals and who spoke at the second Chicago CreativeMornings, encourages the discovery of by-products: “When you make something you make something else. … Everything has a by-product. Observant and creative entrepreneurs spot these by-products and see opportunities.” The pursuit of by-products, the kind that feeds the soul, is the pursuit of happiness. Nick Campbell worked as an animator and a photographer at Digital Kitchen, where he made commercials for television, including title sequences for varied clients. 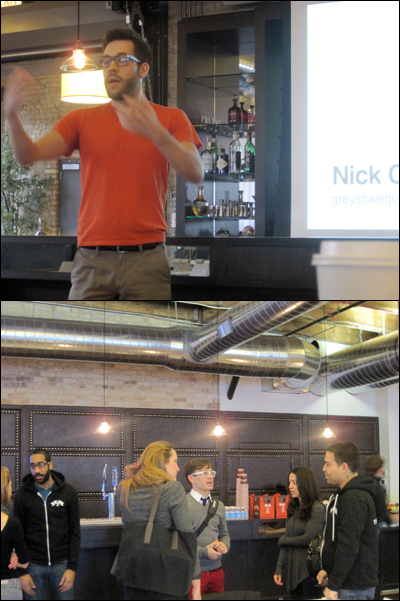 Digital Kitchen was both a presenter and host for Chicago CreativeMornings #4—Read the summary. Big thanks to: Aquent for sponsoring Chicago CreativeMornings #14; Men’s outfitter Trunk Club for hosting; to organizer Mig Reyes, videographers Chris Gallevo and Erick De La Rosa, Isaac Steiner for greeting, and the rest of the Chicago CreativeMornings crew for their great work on making CreativeMornings happen in Chicago. Huge thanks to Mig Reyes for establishing CreativeMornings’ presence in Chicago in 2011 through 2013! 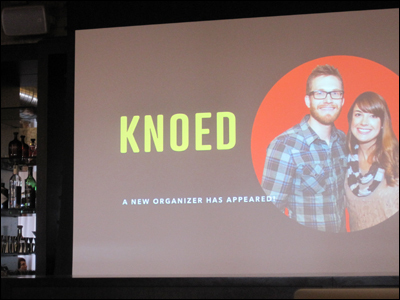 Congratulations to Kim and Kyle of Knoed Creative on becoming the new organizers! Read about their talk at Chicago CreativeMornings #7. Typeface of quotes is Massive designed by Chicago-based Shawn Hazen, who also makes wonderfully bold typographic illustrations for Design Feast series Creative Roles. 2011 was Chicago CreativeMornings’ most excellent debut year. 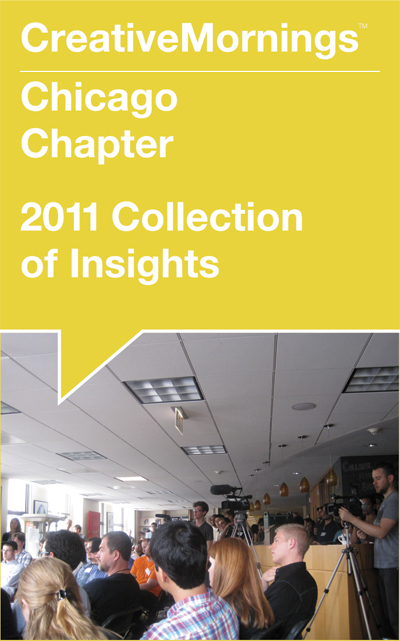 Download a collection of insights.